I thought I'd take a little time to write about something I love to do and have been working at for many years. I have been collecting Flying Eagle and Indian Cent varieties for about twelve years now; it's one of those things that once you start, you can't seem to put down. I got hooked after buying a coin from a dealer/member at one of my local club auctions; it was an 1873 open 3 Indian cent in XF. I got it for CDN price so I was really pretty happy about the purchase, it was not until I got it home and examined it real good that I realized the date was triple punched. I knew nothing about Snow numbers, or even what books to consult for more information on the triple punching, so I went to the internet and discovered the Fly-IN Club and learned a little about its founder and expert on the series Rick Snow. I've since not only learned much about the series itself, but also of the man who designed such a beautiful piece of history. The main focus of the club is the study of James Barton Longacre, Chief Engraver of the mint from 1844-1869. His design of the Flying Eagle and Indian cent series fueled this interest in the early American cent varieties. Rick has developed a system of categorizing and listing not only the different die pairings, but also the numerous varieties found in both the Flying Eagle and Indian cent coinage. The system is appropriately called the Snow variety listings, named after the guy who spent most of his life studying the series and is considered the expert on Snow varieties by PCGS and most all other grading and authentication services. The great thing about collecting varieties is the fact that you don't have to bring out the big bucks for high grade mint state coins. You can spend hours hunting through dealers circulated coins and find some real nice varieties. 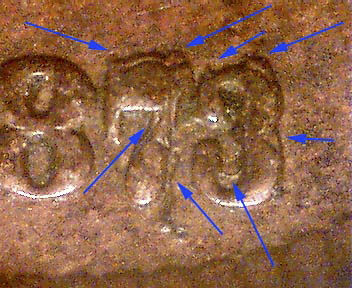 It is also possible to search slabs and find some high grade varieties that others have missed. I found an XF 1873 closed 3 Double Liberty Snow-1 in a dealers circulated coin box, I was originally interested in it because it had a filled 3. I bought the coin for $73.00, and after looking closely at it later, discovered it was the Snow-1 double LIBERTY, a $2000.00 coin. I was immediately offered $1800.00 for it by one of the Fly-In members but couldn't give up my find of a lifetime. Rick has recently released a top 100 variety list for those who are interested in varieties for the series. The club also has a members variety listing that can be used by anyone, while it doesn't provide pictures it does supply a brief description of each variety and has the top 100 listed in red, it can be found at www.fly-inclub.org under LINKS, then Members Varieties. I have always been interested in varieties, and this series has plenty there for the finding. While I find most dealers know to look for the date doubling, the majority of the other not so obvious varieties are often overlooked. I know other series have their varieties and error coins, but the Indian cent and Flying Eagles in circulated grades are very affordable and quite easy to find if you are willing to spend the time looking. It's a great feeling of accomplishment finding a variety that may have been setting around in a dealer's coin box for years unnoticed. The satisfaction of knowing all of the time spent examining coin after coin was not a wasted effort makes one feel pretty good. There is also the chance of finding a variety not yet recorded in the attribution guides. If you would by chance find an unlisted variety and send it in to Rick for verification, if accepted, it would be added to the guides and attributed to you as your find in the books. I don't mean to imply that the Snow attribution guides are the only means of identifying these varieties, there are numerous other guides out there written by Larry Steve and Kevin Flynn, and also David Bowers. With the Snow varieties and as a Fly-In club member though, you are actually able to contribute to the finding and attribution of coins in this series. The club has its own talk site, a place were you can keep in touch with Rick and all the other very knowledgeable FE and IHC collectors to share your finds and ask any questions you may have on the subject. I am writing this solely as information for those who may not be aware of the variety collecting opportunities of the series, and the group that is dedicated to the study and identification of these sometimes very rare and sought after pieces. It is a fun and interesting aspect of the hobby that some of you might not be aware of, do give it a look when time permits.